Once you specify new rules for a feed, all future uploads of this feed will be processed according to those rules. Implement rules for custom labels to structure your campaigns in new ways. For example, you can group products by price ranges or margins, then later bid differently on these groups. Tag your products with a shipping label. For example, you can derive “heavy” from the category, label those products, and define a particular shipping cost for those items. As we introduce the first version of Feed Rules, we’re eager to learn about even more use cases from you. Feedback and suggestions for this feature can be entered directly from your Merchant Center account by clicking the gear icon in the top-right corner of the page and selecting “Send Feedback” to let us know what you think. For more information about Feed Rules, check out our Help Center article, and stay tuned to the blog to learn more about feature updates and enhancements. Finding the right customers on Google Shopping starts with your Merchant Center product feed: it contains all the information about the products you sell to help online shoppers find just what they’re looking for. But we know that creating and maintaining a complete and compliant data feed can be challenging. 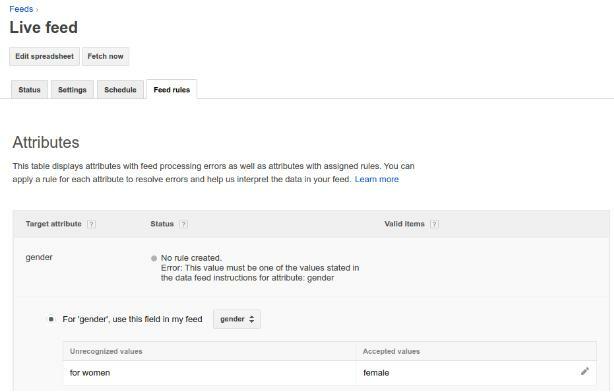 To make feed management easier, we’re excited to introduce Feed Rules, a self-service tool to help you transform your existing data from your inventory management systems into the format accepted by Google Shopping. Feed Rules helps you streamline your data feed uploads, whether you’re already running Shopping campaigns or you’re just getting started.
. Even in the living room, many people prefer to watch on their smartphone – for the control, personalization and ease it offers. And as viewing habits change, we are working to introduce new formats adapted to these habits. That’s why today we’re announcing Bumper ads – a new six-second video format, sold through the AdWords auction on a CPM basis. Bumper ads are ideal for driving incremental reach and frequency, especially on mobile, where “snackable videos” perform well. Given the succinct nature of the format, we’ve seen Bumper ads work best when combined with a TrueView or Google Preferred campaign. In early tests, Bumpers drove strong lift in upper funnel metrics like recall, awareness and consideration. We also see that Bumpers work well to drive incremental reach and frequency when paired with a TrueView campaign. As a quick and fun format, Bumpers lend themselves well to serialized content. Audi Germany cut up their longer TrueView ad to introduce their Q-series SUVs with evocative German “q” words like querpass (cross kick) and quantensprung (quantum leap). Their early adoption of the format mirrors Audi Germany’s tagline “Vorsprung durch Technik” (“advantage through technology”). We like to think of Bumper ads as little haikus of video ads – and we’re excited to see what the creative community will do with them. You can use Bumpers beginning in May by talking to your Google sales representative, and stay tuned as we continue to roll out new ad formats that are uniquely adapted to the way people watch video now, and in the future. Recent research has shown that half of 18-49 year olds turn to their mobile device first to watch video. Even in the living room, many people prefer to watch on their smartphone – for the control, personalization and ease it offers. And as viewing habits change, we are working to introduce new formats adapted to these habits. Tune in live to the Google Performance Summit Keynote on Tuesday, May 24 at 9am PT / 12pm ET to hear the latest Ads and Analytics innovations. We live in exciting times when technology seems to upend everything as we know, every few years. And nothing has changed consumer behavior and business innovation as much as the mobile phone. People are attached to their phones, tapping and swiping their way through places to go, stuff to buy, and things to do. This presents a tremendous opportunity for marketers to connect with customers in more meaningful, relevant ways. And Google is a key partner for advertisers, providing the media and tools to help you make those connections and measure the results. To ensure we are building the right products for consumers and businesses all around the world, my team and I make it a priority to regularly visit our ads and analytics customers. Last year, we met with advertisers in India, Japan, China, the UK and Germany, and gained new insights from every country. For example, in Europe, we learned that universal app campaigns are effective at growing installs across a broad range of app users. Now, advertisers want the ability to reach very specific audiences. In Asia, home to three of the five top smartphone markets, advertisers asked for more control and flexibility on mobile devices for both creatives and bidding. And in every country we visited, we saw customers working hard to integrate data from across their organizations and transform it into actionable insights. Marketers want better data to understand the customer journey across devices, contexts and channels. We were all grateful for these insights and have been using them to build a whole new generation of Ads and Analytics products. We look forward to sharing many new innovations with you at the Google Performance Summit on Tuesday, May 24, 2016 at 9am PT / 12pm ET. Register for the livestream here. Until then, follow us on our +GoogleAds page for sneak previews of what’s to come. and brands have seen great success. But the last piece of the puzzle has been how does online video drive offline sales? This is particularly true for consumer packaged goods (CPG) companies, for which the vast majority of sales – over 90% – happen offline. Thanks to our new integration with Oracle Data Cloud – a leader in the emerging Data as a Service (DaaS) industry that measures the sales impact of digital media – we now have a solution to answer that question. Today we’re announcing the availability of sales lift studies in the US, for CPG advertisers using TrueView video ads. To build this solution we worked with Oracle Data Cloud to develop the first in-depth application of their DLX ROI product on video formats, and we studied a range of CPG video campaigns running TrueView ads across food, health and beauty, beverage and homecare. We built this with privacy at the center, and no personal data is exchanged between the companies. One campaign we measured, Gatorade’s “We Love Sweat,” earned $13.50 sales in return for every dollar spent on TrueView (return on ad spend, or ROAS). This stunning success was due in part to persistent branding and strong creative geared specifically for driving sales. Gatorade’s campaign was also interesting because it delivered a remarkable 16% lift in sales among new buyers that had seen the video vs. new buyers that had not – according to Oracle Data Cloud a typical lift in this metric hovers around 2.5%. Similar to Gatorade, parent company PepsiCo also saw sales lift success with their campaign for Doritos. Not only did our DLX ROI solution show that their 30-second creative drove higher lift in sales among exposed households than a 15-second version, but they saw particular targeting techniques – namely topic targeting and remarketing – drove greater sales lift compared to a demographic target. Mars also participated in our DLX ROI test for their Pedigree pet food brand, and the sales lift studies helped them make key creative decisions. They tested a video that opened with strong branding against one that saved their branding for the end, and learned that the video with strong upfront branding drove nearly 7x greater sales lift. As Laurent Larguinat, Global Director of Mars Consumer and Market Insights said, “With this new offering, YouTube is rounding out a full funnel measurement solution for video. We're excited to continue to see these results for all of our campaigns." This new sales lift offering drops the last piece into place for full funnel measurement of CPG campaigns on YouTube, and we’re excited to bring you new creative and media strategy insights that drive incremental sales as we scale these studies. Measuring the impact of online video is something of a passion for us at Google. It’s been three years since we unveiled Brand Lift for YouTube and brands have seen great success. But the last piece of the puzzle has been how does online video drive offline sales? This is particularly true for consumer packaged goods (CPG) companies, for which the vast majority of sales – over 90% – happen offline. Thanks to our new integration with Oracle Data Cloud – a leader in the emerging Data as a Service (DaaS) industry that measures the sales impact of digital media – we now have a solution to answer that question. Today we’re announcing the availability of sales lift studies in the US, for CPG advertisers using TrueView video ads. , a free tool to help brand manufacturers accurately represent their products to shoppers on Google.com and other Google services. By uploading complete and accurate product data into Manufacturer Center, brands increase their chances of standing out in a crowded marketplace -- and ultimately get more of their products in the hands of consumers. Today, we’ll shine a light on three manufacturers who have boosted results with Manufacturer Center, and highlight new partners that can help manufacturers maximize the tool. Detailed product data enables more relevant search results. 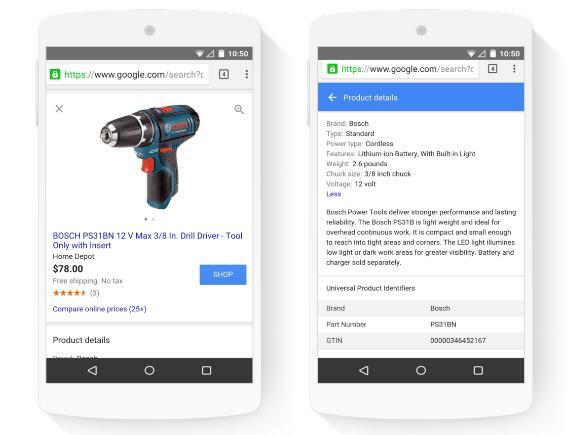 Product descriptions submitted by manufacturers contain key product attributes, which allow Google to surface Shopping ads (created by retailers) for those products when users search for those attributes. GTIN identifiers enable Google to match manufacturer content to ads and information cards for the same products. High quality data helps users decide what to buy. By uploading better images and detailed product information, manufacturers can improve the accuracy and completeness of how their products are represented. This helps consumers decide which product to buy. Manufacturers can choose to either upload their product data directly to Manufacturer Center or work with an approved Google Shopping Partner that integrates with Manufacturer Center. In addition to our existing partners, we're announcing 4 new partners: Webcollage, Channel Advisor, Informatica, and GfK Etilize. These partners are industry leaders in organizing and distributing product data. Below, learn how three manufacturers -- Bosch, JanSport, and Speakman -- are using Manufacturer Center to help their shoppers make more informed buying decisions. Bosch, a leading power tool and accessories brand, has been an early adopter of Manufacturer Center, using the tool to upload rich product data for use in Shopping ads. Before Bosch added product data via Manufacturer Center, a user that searched for “lightweight drill” was unlikely to find the Bosch PS31BN Brushless Drill. The product description provided by Bosch, however, highlighted that the PS31BN is compact and lightweight. Even Shopping ads that don’t display product descriptions can benefit from this additional information, helping Google show the most useful ads to users. Now, when users search for “lightweight drill”, they are much more likely to find the PS31BN. As a result of uploading this more accurate, descriptive data, Bosch saw a 4% uplift in conversions across their updated products on the sites of retailers advertising Bosch products on Google. During the 2015 back-to-school season, JanSport, the world’s leading and largest backpack maker, used Manufacturer Center to overhaul their product images, descriptions, and details to improve how their products appear on Google. For example, JanSport updated their Big Student model backpack by including richer descriptions that highlight the product’s two large compartments, water bottle pocket, and extra large capacity. This information helped create more effective listings on Google Shopping and other Google services like Google Express, letting shoppers better understand what they’re buying. Jansport saw a 13% increase in conversions originating from Google for their backpacks with updated product data, compared to benchmark products without updates. Speakman, manufacturer of premium shower and bath products, was an early adopter of Manufacturer Center. They worked with Salsify, a Product Information Management partner, to send their rich product information to Manufacturer Center for use in Shopping ads. 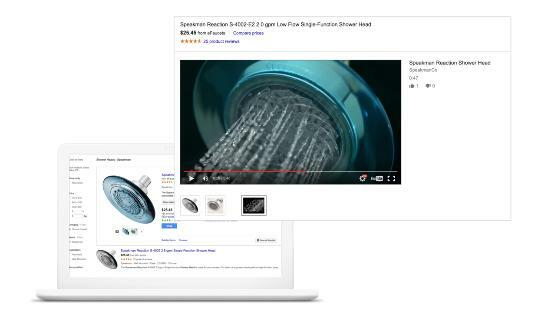 With the addition of richer and more complete data, including multiple product images and even videos of their products in action, Google was able to increase relevancy for users searching for Speakman products like their Speakman Reaction and Icon shower heads. After updating product data, Speakman saw an 8% uplift in conversions originating from Google, compared to benchmark products that were not updated. Simply put, Manufacturer Center allows manufacturers to elevate their brands and ultimately attract more shoppers online. If you’re a brand manufacturer and are interested in getting started with Manufacturer Center, complete our interest form and we will reach out with next steps. If you already use a PIM, ask how you can get your data sent to Manufacturer Center for use across Google. Google provides consumers around the world with the answers they need to find, review, and buy the products they’re looking for. Last year, we announced Google Manufacturer Center, a free tool to help brand manufacturers accurately represent their products to shoppers on Google.com and other Google services. By uploading complete and accurate product data into Manufacturer Center, brands increase their chances of standing out in a crowded marketplace -- and ultimately get more of their products in the hands of consumers. Today, we’ll shine a light on three manufacturers who have boosted results with Manufacturer Center, and highlight new partners that can help manufacturers maximize the tool. ” (aka UI Redress) as an emerging threat to cost-per-click display ads, and we’ve rolled out new defenses to protect advertisers against this threat. Clickjacking is a type of web attack where the appearance of a website is changed so that a victim does not realize they are taking an important action, in this case clicking on one or more ads. For example, a user may intend to click on a video play button or menu item, but instead clicks an invisible ad unit. Figure 1: An example of a clickable ad hidden behind a video playback button. Earlier this year when our operations team identified Clickjacking activity on our display network, they moved swiftly to terminate accounts, removing entities involved in or attempting to use this technique to trick users. Our engineering team worked in parallel to quickly release a filter to automatically exclude this type of invalid traffic across display ads. This approach delivered a one-two punch to publishers who violated our policies: our operations team, which forms an early line of defense against invalid traffic, cleaned out publishers from our ad systems, while engineers built a new filter as a durable defense to protect against Clickjacking traffic. Figure 2: An example of mouse-tracking, which leads to a page with lots of ads being opened regardless of where a user clicks. Even as there are ongoing attempts to perpetrate this type of attack, our ongoing and proactive hunt for emerging types of invalid traffic has enabled us to move early and quickly to address Clickjacking threats on several occasions. Our Clickjacking defenses operate at considerable scale, analyzing display ad placements across mobile and desktop platforms, evaluating a variety of characteristics. When our system detects a Clickjacking attempt, we zero-in on the traffic attributed to that placement, and remove it from upcoming payment reports to ensure that advertisers are not charged for those clicks. This latest effort also is a great example of how our work against invalid traffic is at the intersection of technology, operations, and policy. Each piece plays a key role in keeping our ad systems clean and defended against ad fraud. We’re proud of our work to protect our ad systems against emerging threats like Clickjacking, and we’ll continue to be vigilant as we fight the good fight against ad fraud. At Google we defend our ad systems from fraud using technology in a variety of ways. Often our investment in these defenses goes beyond protecting against only known threats. Our engineering and operations teams are continually working to identify new and emerging threats. Once a new ad fraud threat is found, we move quickly to defend our systems against it using a combination of technology, operations, and policy. Recently we identified “Clickjacking” (aka UI Redress) as an emerging threat to cost-per-click display ads, and we’ve rolled out new defenses to protect advertisers against this threat. Clickjacking is a type of web attack where the appearance of a website is changed so that a victim does not realize they are taking an important action, in this case clicking on one or more ads. For example, a user may intend to click on a video play button or menu item, but instead clicks an invisible ad unit. Today, people have higher expectations of ads than ever. It’s never been more important to tailor messages to the right people at the right moment as they engage in blogs, news sites and more across the web. Check out these display advertising best practices to deliver on consumers’ expectations and drive more sales for your business.